Every business in competition with other businesses needs something tangible to set them apart from the crowd. 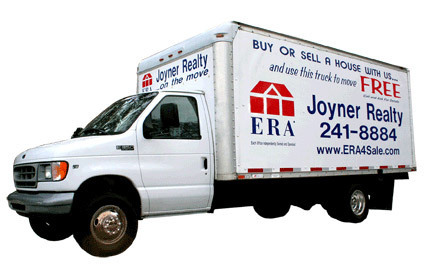 In addition to our unsurpassed dedication to ethics and customer satisfaction, we at ERA Joyner Realty also offer tangible evidence of our unique approach to marketing properties. Generating a never-ending stream of telephone calls, our moving truck is a one of a kind offering in the Valdosta real estate market. Available locally to anyone who buys or sells a home with one of our agents, the truck demands attention as it backs into driveways or travels down highways. In addition to saving a substantial amount of moving expense for our buyers or sellers the truck is a marketing tool and amounts to what is effectively a moving billboard. Anytime someone sees the truck they are reminded of our agency and ultimately the property we have available for sale. You may schedule the use of the truck through your real estate agent, or you may call Lynn Smith at (229) 241-8884 for more information.